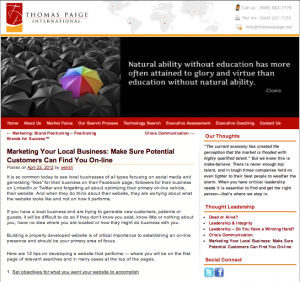 Warren Ellish, President and CEO of Ellish Marketing Group is featured as a guest blogger in Thomas Paige International’s Leadership Insights. Five great thought leadership blogs from industry experts are highlighted. Check out all of the blogs from Joleen Goronkin, Rick Van Warner, Rob Grimes, Tom Spry and Warren Ellish. It is so common today to see local businesses of all types focusing on social media and generating “likes” for their business on their Facebook page, followers for their business on LinkedIn or Twitter and forgetting all about optimizing their primary on-line vehicle, their website. And when they do think about their website, they are worrying about what the website looks like and not on how it performs. If you have a local business and are trying to generate new customers, patients or guests, it will be difficult to do so if they don’t know you exist, know little or nothing about you, have no idea where you are located or how they might do business with you. Building a properly developed website is of critical importance to establishing an on-line presence and should be your primary area of focus. Here are 12 tips on developing a website that performs — where you will be on the first page of relevant searches and in many cases at the top of the pages. While it is important how your website looks, it is even more important how it works. I hope the objective is not to “look cool” (or something like that), but rather to allow people looking for your type of goods or services to easily find you and learn something about your business and how you can help them. Your communication strategy should link directly to your brand positioning. Your target audience should be able to relate easily to your website and understand what business you are in and what your point of difference from your competition is. You must also identify what specific web pages are appropriate and needed to implement your strategy. Select a domain name that combines the business you are in, your geographical area and an adjective that people would use when conducting their search. For example, if you were a dentist in New York or an Italian restaurant in Alpharetta, effective domain names might be NewYorksBestDentist.com and PopularAlpharettaItalianRestaurants.com. You want the freedom to be able to move your site hosting and development wherever and whenever you desire, and you should be able to make simple updates and enhancements to your site by yourself. WordPress is a great free platform to consider. Define search terms (combinations of words) that you think someone looking for your business would type into his or her search browser. Then develop unique META (title, description and keywords) for each page of the site. Make sure to follow a strict character count for each; too many will negatively affect your search results. Design Facebook, LinkedIn, Google+, YouTube, and a blog into your site when applicable and when it fits comfortably. Remember that if you integrate with a social source, you need to have a presence on a regular basis to be relevant. And make sure your employees are aware of and engaged with your social efforts. Make sure people can use your site no matter where and how they link to the Internet. Ask current customers, patients and guests to write reviews for your business. Postings to Google Places and other local review sites will boost your search ranking. Offer easy links to these different review sites within your own website and boost your ranking even further. Make sure you sign your business up with Google Places (which will become linked to your site). Don’t trust a company developing your site that tells you once the site “looks good” to go live and post your site and then they will work on content, META, SEO optimization etc. Optimize everything before going live. Once you launch your site, your work is not over. Good sites that rank high constantly enhance their content and coding. Be sure to use some form of analytics tracking built into each page of your site. Google Analytics is a great free option. If you have a business that generates call inquiries or requires reservations or appointments, utilize a unique phone tracking number on your website that will allow you to track responses accurately. You can even have the calls, forwarded from this unique tracking number, recorded for training purposes. Ellish Marketing Group (EMG), a leading authority on brand positioning and marketing to a wide range of businesses including restaurants, dental practices, retailers and consumer product companies, announced that Meyer & Lydiatt Family Dentistry, Colorado Springs’ premier dental practice, has chosen Ellish Marketing Group as marketing and advertising agency of record. EMG will manage branding, marketing and advertising for the practice. 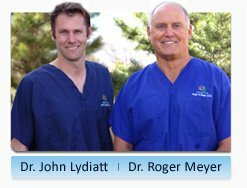 Meyer & Lydiatt Family Dentistry has been serving the dental needs of families in Colorado Springs since 1980. Doctors Roger Meyer and John Lydiatt bring fifty years of personalized professional experience in putting smiles on patients” faces. The practice is located at 6665 Delmonico Drive (Suite C) at the southeast corner of E. Rockrimmon Boulevard and Delmonico Road – just one mile west of I-25 and Woodmen Road.